The Parkdale 107.1 FM antenna is up and running as of Monday June 20, 2016 at 8 p.m. Now our upper Hood River Valley radio listeners can tune into us at 107.1 FM. 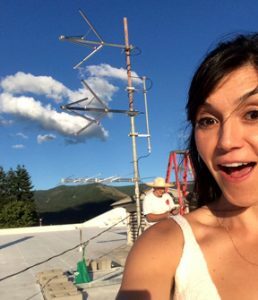 Due to the geographic features of the Columbia River Gorge, Radio Tierra, in order to reach greater distances, has had to construct several translater stations–each includes an antenna and houses a receiver and transmitter to rebroadcasts the signal. Our thanks to Garrett Sharp, Gray Frierson Haertig, Robert Rogers, Francisco, Erubiel Valladares, Alejandro, Jose. who did a great job prepping and installing the antenna. Augsperger 96.7 FM. We constructed another new translator station on Augsperger Mountain near Carson Washington in May, which greatly expanded our signal reach. A special thanks to board member Garrett Sharp who was instrumental in making this expansion happen.